Oh, Yeraldy, you've got my heart. Meet the happiest and most care-free young adult Sim I have in my game. With Yeraldy, there is never a dull moment. You literally cannot be bored around her, as she'll always find something fun to do. This is most likely why there was instant chemistry between her and Jordan. Her cheerful aura and warm smile brightens any room she walks into. She enjoys the finer things in life, taking her friends out for dinner and retreating at tropical destinations every once in a while. Despite having a bubbly personality and an easy-going nature, she tends to become a little paranoid when she's alone, sometimes taking overthinking a bit too far. Because of this, she prefers being in the company of her friends and family. 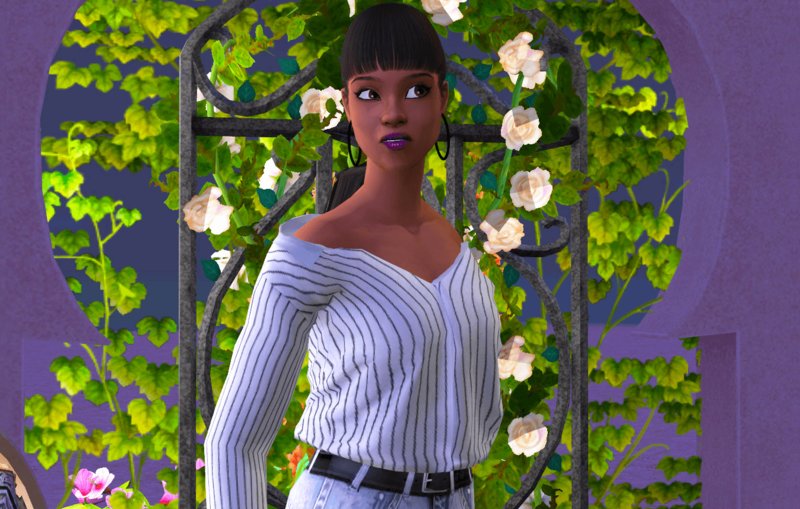 Yeraldy dreams of becoming a world-renown plastic surgeon, so she tries really hard to keep a healthy balance between her personal life and being a college student majoring in biology. Can we take a moment to talk about how adorable Jordan and Yeraldy are as a pair? Inevitably, Jordan passed some of his mischievousness down to her. While on a date, they decided to mess with a community fountain and throw a box of soap in. It's just too funny to me how she looks back at him like "Do you see this sh*t Jordan??". You can only imagine the look of pride on his face. TREAT HER RIGHT! She deserves it. Voeille for the AMAZING community lots and the other creators whose CC I've featured in my photos.